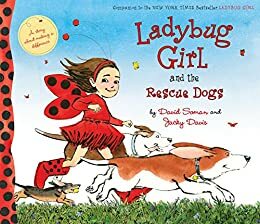 Lulu the Ladybug Girl is at the local farmers market when she notices a dog-adoption fair happening. Once Lulu meets all the dogs, she wants to take them all home but her family already has one dog, Bingo which is more than enough for them. Since she is unable to adopt any more dogs, she volunteers to help take care the dogs and help promote the pet-adoption fair since it doesn't receive much foot traffic. Even though this is the tenth book in the Ladybug Girl series, this was my first time reading a book from the series. The tots I read too enjoyed the book and the fun illustrations and many of them spied toys in the illustration similar to the ones they own. They also like the illustrations with the different ways to take care of a dog, for example, the dog who couldn't play catch. I liked how the book showed how one small change can have a big impact. It is a great read for any animal lovers as well! 1. What is your favorite dog breed? 2. Can you draw your favorite dog? 3. What is your favorite activity to do with your pet? 4. Can you think of other small changes people can do that will make a big difference? 5. What is your favorite thing to do at the farmers market? 6. What traits would your ideal pet have? 7. Can you create an action plan for taking care of a dog? 8. What is one thing you can do to help your community?